Driving around the neighborhood these days it appears there are an unusual number of houses up for sale. I was wondering if this is indeed the case. Are there more homes for sale in Allandale today than two or three years ago before the economy went bad? What about home values in the area? Are they holding up? We know it’s a tough real estate market nationwide, but what is happening with real estate in our neighborhood? Ruth Vela, realtor with Avenue One Properties, provided me with 5 years of statistics for the area and offered this analysis. “Looking closely at the numbers of sales in Allandale during the same time periods for the last 5 years, it is interesting to note that our prices have not dropped drastically. Between the years 2008 to 2009 the sales price drop was a little over $11,000. This year compared to last year it’s right under $11,000. The days on the market has increased by about 14 days on average, and the average price has dropped slightly by just under $3.00 per square foot. 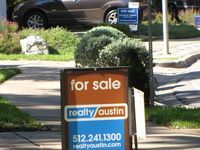 “Working in real estate these days is challenging and interesting, and the media seems to have done Austin an injustice. Looking at our Allandale neighborhood alone, you can see that we don’t quite fit the norm. Yes, there seems to be a high inventory of homes for sale, but the days on the market and the average prices have not dramatically changed in comparison to other major metro areas in the nation. The picture is interesting … looking at the background, the sign appears to be in the yard of a friend who is selling their home of many years. Sad to say this relator (possibly it in only the agent whose name is cut off in this picture) is doing this family no favor. Initially, the brochure box was empty with some message about being green and going to the web. Numerous potential buyers stopped, got out of their vehicle to find thin air in the brochure box. When the brochure finally appeared, the price was buried in fine print in the body of the brochure. Initially I could not find the price … but finally did after VERY close inspection. The family finally redesigned the brochure with the price in large print and top center where it belongs. The agent, who I have been told is a former Allandale resident told the owners that there would not be any open house because they do not work. While the agent was forced to because the owner pointed out that an open house was part of the listing agreement, there were NO signs advertising the open house posted prior to the agents arrival at the property for the open house. If you have to leave Allandale as these owners are, choose your agent wisely and know what your agent as agreed to do to sell your property in a timely manner.